Education is a multi-stage process of building character, acquiring knowledge and improving skills for life-long learning to lead a happy and peaceful life. Engineering education is discipline-specific and outcome based, which involves the application of basic principles of Mathematics and Science to solve practical engineering problems, to innovate newer technologies for providing feasible solutions to the futuristic challenges. Our College, started in the year 2012, endeavour to create young and dynamic Engineers who will form the vital technical workforce for the future. The College is situated in a calm, green and serene atmosphere wherein students can imbibe knowledge through continuous learning to scale up to newer heights in all their endeavours by keeping in touch with the nature, who is the mother of all innovations. Our aim is to provide a good quality engineering education through innovative teaching, research and extension activities for the overall development to achieve academic excellence. Our Institute has state-of-the-art infrastructure, modern machinery/equipment, recent software and hardware and an extensive internet band width to facilitate students and faculty members abreast with the latest developments in the changing scenario of technology and to meet the ever-improving requirements of the teaching-learning profession. It has always been our belief that every student has an unending pool of talent that needs to be fostered. A proper care and guidance will help the students to develop right attitude, values and practices that enable each individual to excel in future. The main focus of our Institution is to empower students with sound knowledge, wisdom, passion for innovation and latest know-how in cutting-edge technologies to experience and face the challenges of Industry 4.0 in a highly networked global perspective. The wonderful infrastructure and good learning environment prevailing in our College help to provide an enjoyable and easy learning experience to all our students. The inspiration and commitment of our Management to continuous improvement and the hard work of the faculty members towards the overall growth of our students ensures that every student passing out of our College will taste the success in any sphere of life they choose to work. I hope that their desire to contribute for the benefit of the society grows with their happiness and prosperity in life. 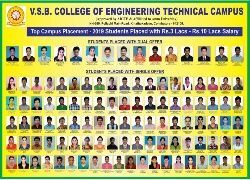 I welcome the students from various parts of the state and country to join the VSB educational family, devote 4-years of time to learn the latest and get transformed into knowledgeable Engineers for futuristic needs. I wish all our students and graduates a great success and expect them to be proud VSBians.